This friendly book and CD set is filled with clawhammer banjo instruction, tablature, lyrics, tune histories, chords, playing tips, vintage photos, and more. Includes such classic old-time tunes as Soldier's Joy; Cluck Old Hen; Arkansas Traveler; Leather Britches; Mississippi Sawyer; Chicken Reel; Shady Grove; Red Rocking Chair; John Henry; Uncle Joe; Little Rosewood Casket; The State of Arkansas; Hogeye; The Old Spinning Wheel; and When You and I were Young Maggie. The Cd recording that accompanies this book is entitled 'Southern Mountain Classics'. It includes the true classics of old-time mountain music played on clawhammer banjo, fiddle, mandolin, dulcimer, guitar, bass and buckdancing. Note: Not every tune on the recording features banjo. 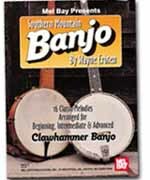 However, the book teaches the banjo parts even on those tunes where no banjo is playing.